Western blot analysis of extracts from PC-3 cells and wild-type (wt) and Nf2 knockout (-/-) mouse embryonic fibroblasts (MEFs), untreated (-) or λ phosphatase-treated (+), using Phospho-Merlin (Ser518) (D5A4I) Rabbit mAb (upper), Merlin (D3S3W) Rabbit mAb #12888 (middle), or Ezrin/Radixin/Moesin Antibody #3142 (lower). (MEF wt and MEF Nf2 (-/-) cells were kindly provided by Dr. Andrea McClatchey, MGH Cancer Center and Harvard Medical School, Charlestown MA). Immunoprecipitation of Phospho-Merlin (Ser518) protein from PC-3 cell extracts using Rabbit (DA1E) mAb IgG XP® Isotype Control #3900 (lane 2) or Phospho-Merlin (Ser518) (D5A4I) Rabbit mAb (lane 3). Lane 1 is 10% input. 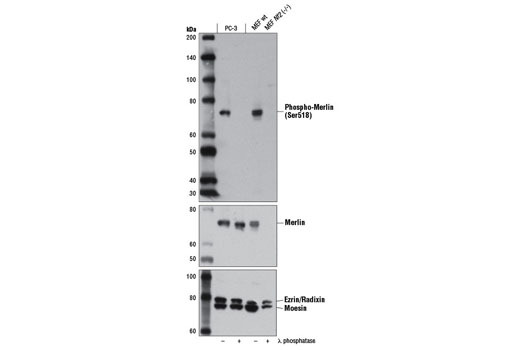 Western blot analysis was performed using Phospho-Merlin (Ser518) (D5A4I) Rabbit mAb. 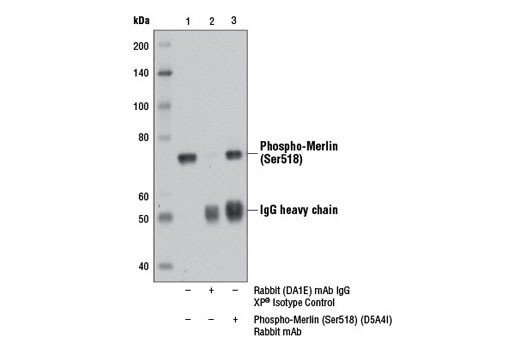 Phospho-Merlin (Ser518) (D5A4I) Rabbit mAb recognizes endogenous levels of merlin protein only when phosphorylated at Ser518. Monoclonal antibody is produced by immunizing animals with a synthetic peptide corresponding to residues surrounding Ser518 of human merlin protein. Neurofibromatosis 2 (NF2) is an autosomal dominant, inherited disorder characterized by the occurrence of vestibular schwannomas, meningiomas, and other nervous system tumors. Both the familial tumors of NF2 and equivalent sporadic tumors found in the general population are caused by inactivation of the NF2 tumor suppressor gene. Merlin (moesin, ezrin, and radixin-like protein) is the NF2 gene product, displaying striking similarity to ezrin, radixin, and moesin (ERM) proteins. Regulation of merlin (also called schwannomin) and ERM proteins involves intramolecular and intermolecular head-to-tail associations between family members (1). Merlin and ERM proteins act as linkers between the plasma membrane and the cytoskeleton, affecting cell morphology, polarity, and signal transduction (2). Merlin is phosphorylated by the Rac/Cdc42 effector p21-activated kinase (PAK) at Ser518, negatively regulating Rac (3,4). Ramesh, V. (2004) Nat. Rev. Neurosci. 5, 462-470. Bretscher, A. et al. (2002) Nat. Rev. Mol. Cell Biol. 3, 586-599. Xiao, G. H. et al. (2002) J. Biol. Chem. 277, 883-886. Kissil, J. L. et al. (2003) Mol. Cell 12, 841-849.